There needs to be a true stepping back and understanding of today’s consumer and retail realities. Companies need to become completely customer-centric and have the latest technologies and analytical tools at their disposal. No stone should be left unturned as they pursue this strategy. Every decision should be customer centric. A successful business likely focuses on the consumer and puts them first. Include mobile commerce in your strategy in order to serve consumers where they are. Smartphones will become many customers’ primary shopping tool. Retailers who don’t get this right will likely be left behind. Offer personalization. Not only is it valuable to the consumer, but today’s consumers typically expect it and can easily find a competitor that offers it if you don’t. Offer a differentiated service or product that will make consumers come back. Attracting repeat customers in a market with so many alternatives is crucial. Make sure your customer experience is meaningful. Use technology and data to create a differentiated experience that makes customers come back for more. Look into how augmented and virtual realities can help you drive business. The first movers and fast followers may take significant share. Understand how you can maximize your data. Data is only useful when turned into insight. 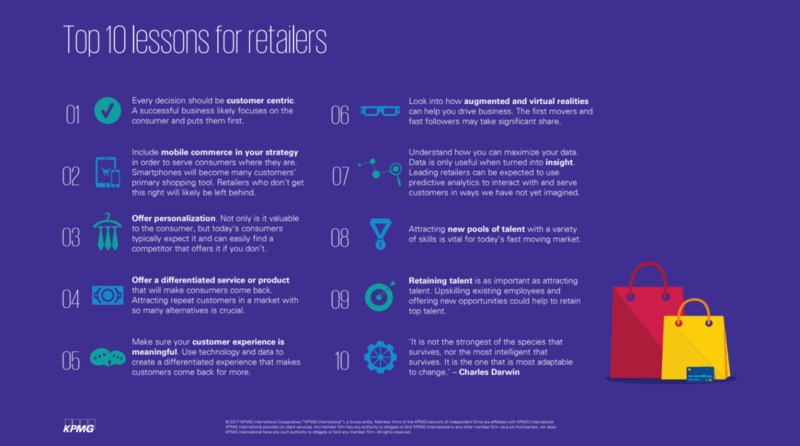 Leading retailers can be expected to use predictive analytics to interact with and serve customers in ways we have not yet imagined. Attracting new pools of talent with a variety of skills is vital for today’s fast moving market. Retaining talent is as important as attracting talent. Upskilling existing employees and offering new opportunities could help to retain top talent.